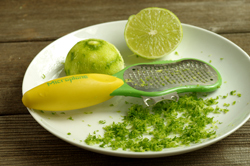 This recipe is an ode to the delicate blend of herbs and spices commonly found in Thai cuisine -- in this case, a blend of ginger, lime, and lemongrass. If you like your food hot, feel free to up the ante by adding more jalapeño. 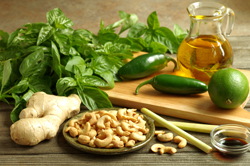 Place the basil, cashews, lime zest and juice, ginger, jalapeño, soy sauce, and lemongrass in the bowl of a food processor and pulse until a coarse mixture forms. 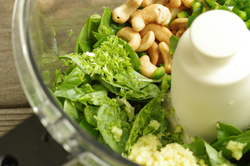 With the machine running, gradually stream in the oil and blend until the pesto emulsifies. Toss with shrimp, 1 to 2 tablespoons of oil, your favorite Asian noodles (such as wheat, egg, ramen, or rice noodles), and sautéed mushrooms and onions. Add to any stir-fry. 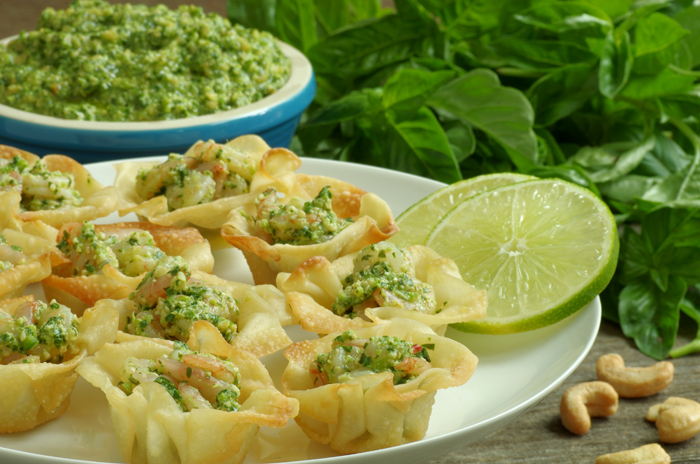 As an appetizer, serve wonton cups filled with seared fish that has been mixed with the pesto and garnish with ribbons of fresh basil. Brush wonton wrappers with a little melted butter, press them into the depressions of mini muffin tins and bake for 6 to 8 minutes, until lightly browned and crisp. Remove from the tins and let cool on wire racks.